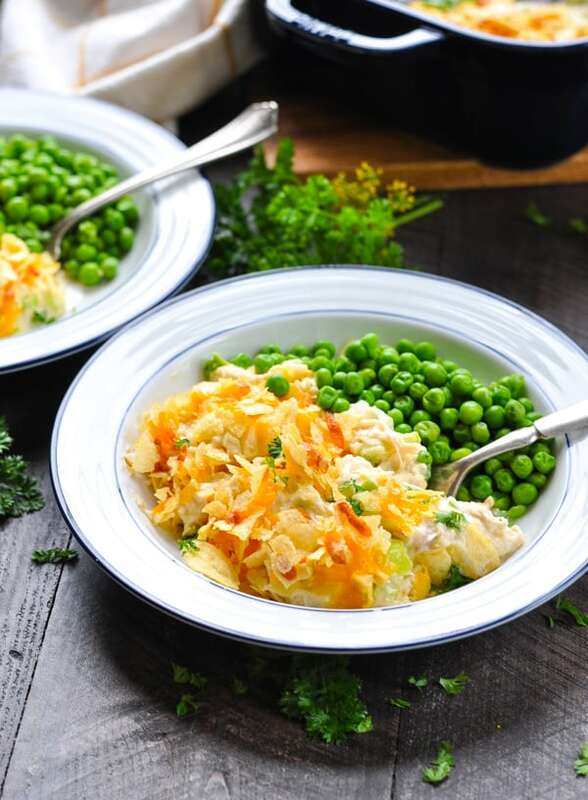 Take the traditional flavors and ingredients from your favorite summer sandwich and combine them in a comforting Dump-and-Bake Southern Chicken Salad Casserole -- complete with crushed potato chips and melted cheese on top! Thirty minute meal to the rescue! 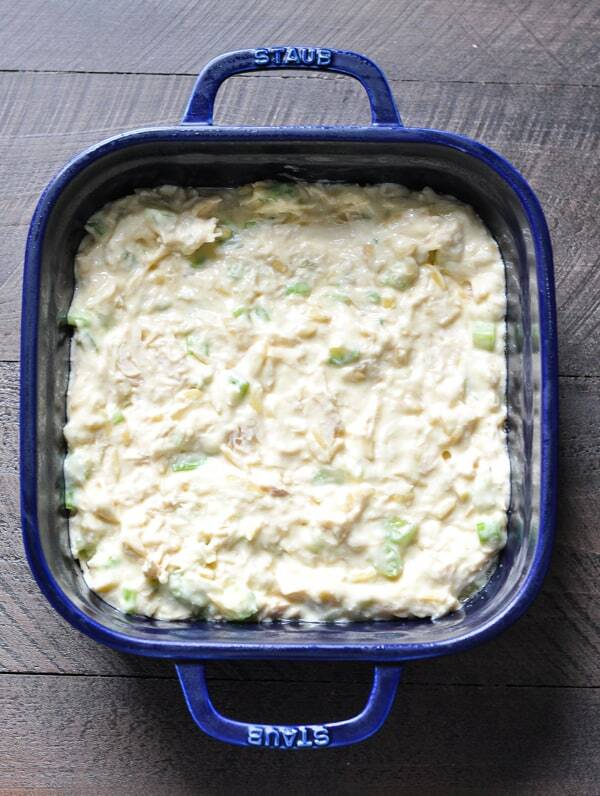 This cozy Dump-and-Bake Southern Chicken Salad Casserole is the perfect easy dinner recipe for busy fall nights! When the weather is warm, one of my favorite lunches to order in restaurants is a classic chicken salad sandwich. But when the temperatures drop, I gravitate to warmer soups, chili, and toasted sandwiches. Fortunately, I can also enjoy the texture and flavor that I love in my classic chicken salad sandwich in a cool-weather comfort dish for dinner! What goes into Chicken Salad Casserole? cream of chicken soup (because this is a southern casserole, after all)! 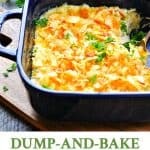 Just stir it all together and “dump-and-bake”! But before it goes into the oven, don’t forget the topping! You can’t have a southern chicken salad casserole without some potato chips and cheese on top. OH.MY.GOODNESS. This classic addition is so darn good! 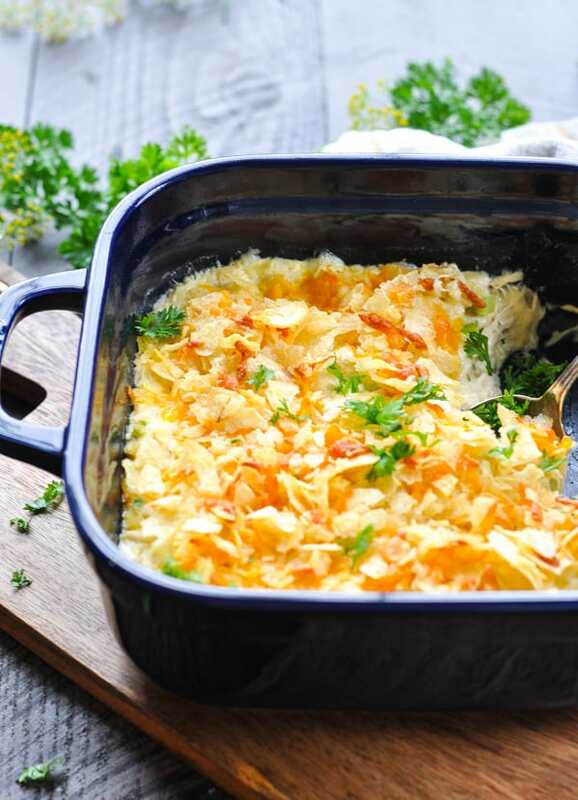 Just sprinkle a combination of the chips and grated cheddar over top of the dish and pop it in the oven for about 20 minutes (or until it’s heated through). How Can I prepare Chicken Salad Casserole in Advance? 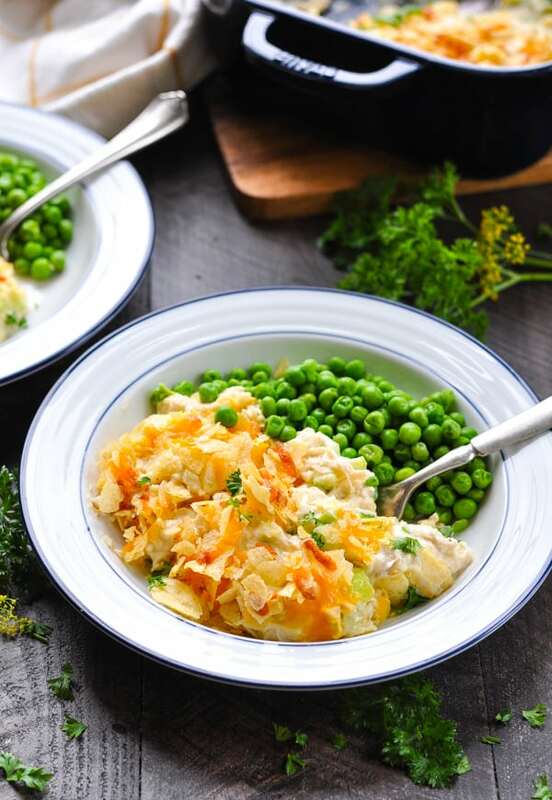 Not only is this time-saving dump-and-bake dinner convenient for last-minute meals, but you can also prep it ahead to take the stress out of entertaining or family mealtime. Just assemble the casserole as instructed, cover, and keep it in the refrigerator until you’re ready to bake it! The assembled casserole should be fine in the refrigerator for at least 24 hours. 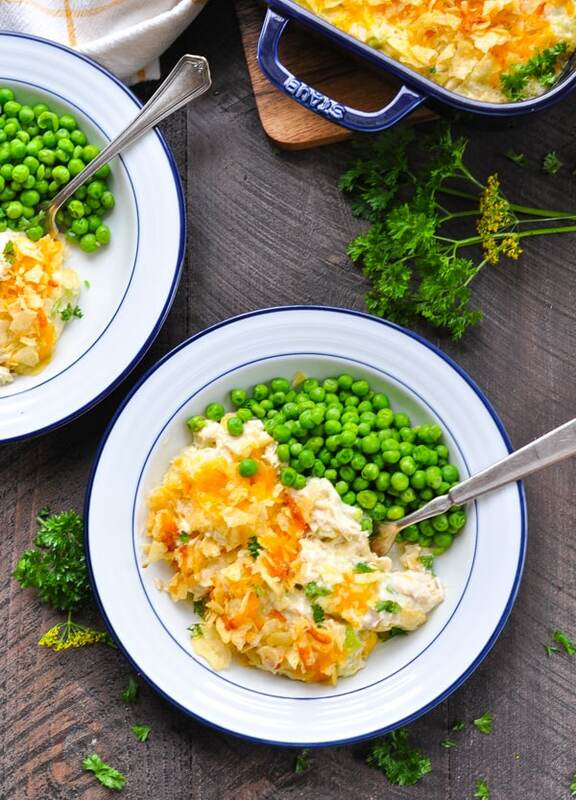 Whether you’re just trying to get a family-friendly dinner on the table for your picky kids during the school week, or whether you’re looking for a crowd-pleasing option for the next church potluck, this hot chicken salad casserole is a guaranteed winner every time! Keep it simple and steam some green veggies in the microwave to round out your meal, throw together a tossed salad, or prepare a batch of our favorite Southern Green Beans in the slow cooker! All of my boys love this easy dinner, but my older guys (including Keith) prefer the hot casserole sandwiched in between pieces of thick, crusty bread. Warm or cold, you can never go wrong with a classic southern chicken salad sandwich, right?! Either way, this delicious lunch or dinner is a true delight! 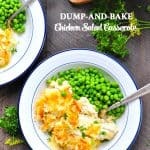 If you’ve tried this Dump-and-Bake Southern Chicken Salad Casserole or any other recipe on The Seasoned Mom, then don’t forget to rate the recipe and leave me a comment below! You can follow me on Facebook, on Instagram, on Pinterest, and on Twitter! Preheat oven to 375 degrees F. Spray a 2-quart casserole dish with cooking spray and set aside. In a large bowl, stir together all ingredients except for cheese and chips. Place chicken mixture into prepared casserole dish. 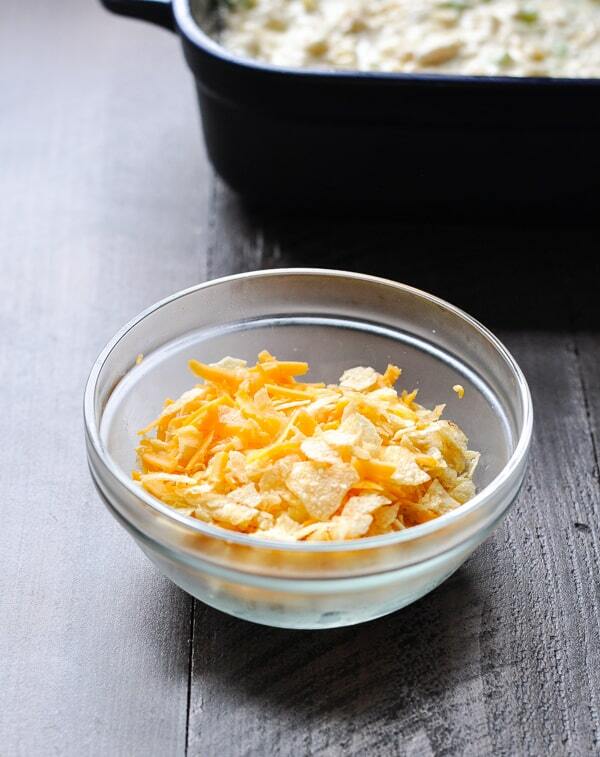 In a separate bowl, mix together cheese and chips. 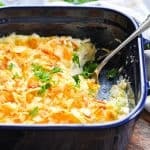 Spread cheese mixture on top of casserole. Bake, uncovered, for 20 minutes or until heated through. Cooking Just for Two? 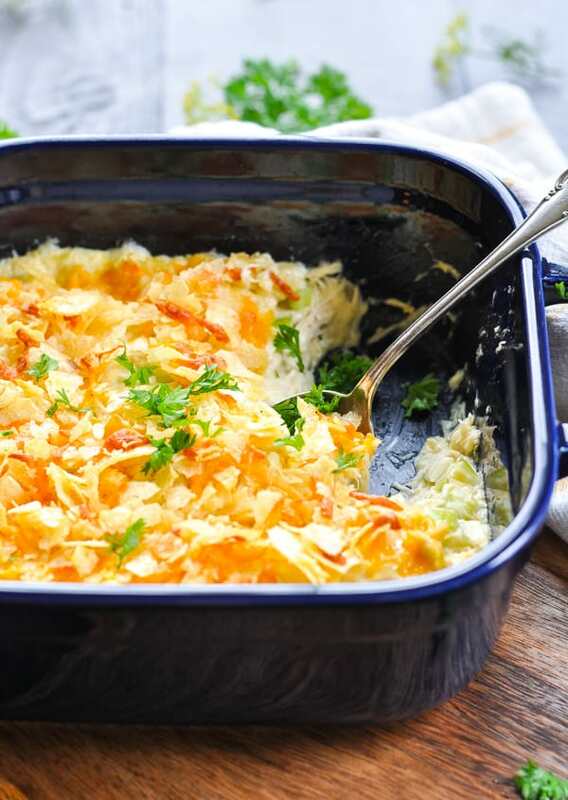 Cut the ingredients in half and bake the casserole in a 1-quart dish. The rest of the instructions remain the same. Cooking for a Crowd? 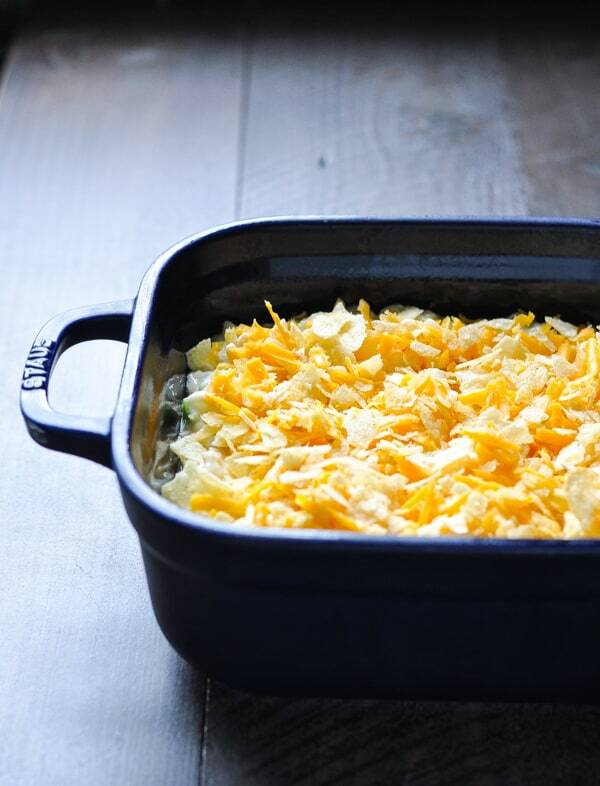 Double the ingredients and bake the casserole in a 9 x 13-inch dish. The rest of the instructions remain the same. This recipe was originally published in November, 2014. The photos were updated in September, 2018. Thanks, Sara!! I appreciate the pin, and I hope that you enjoy it! Sounds like a great casserole! Once the weather turns colder, I look for more comfort food type meals too. This is perfect! That’s a great idea, I love classic chicken sandwiches! This has been featured as the most viewed recipe on Sweet and Savoury Sundays. Stop by, grab a button and link up again with us. Have a great day Blair! Blair this looks like perfect comfort food, either with the side salad, or smashed into a sandwich! OMG Blair this is so awesome! We loved it. The only thing I did different was to throw in some leftover frozen peas. Was delicious! Hubby loved it, thank you for sharing. Awesome! I’m so glad that you enjoyed it! Thanks, Deborah! Cannot get ANY of your recipes to print, tried others and they do print. I’m lazy and don’t want to write them out, They sound wonderful. Can you check it out! Hi, Sandra! I’m sorry that you’re having trouble with printing the recipes. I have tested it on my end, and it seems to be working fine. I also have not received questions from anyone else with this problem. I’m wondering if your computer is blocking the pop-up from the program, which opens the printable recipe in a new window?